I didn't follow this thread or this new game. Good thing i follow Mace on twitter. It's a new game to be released next year. "Start the life of an idol! Let's get STAR~ted!" I know what I have played this game "Tri Focuser". I HAVE PLAYED THIS GAME FOR A MONTH. I see what's going on here. I found something interesting. The storyline begins where Aya and Hatate were informed by the new great tengu boss Tenmu Suitokuin, to find the angel who went away from Gensokyo. ►Scene 1 Storyline shows that they were encountered by the lost sheep, Marry Shephard. I got the feeling about that quiet dialogue that I have seen this - wool factory? Is she going to industrialize the world with sheeps? Maybe you'll have to find out. ►Scene 2 Storyline shows that the high-temperate rodent, Momo Tobikura appeared right in front of them to say what the tengu are doing for the future. I don't get this youkai, she's similar to Mamizou, perhaps. 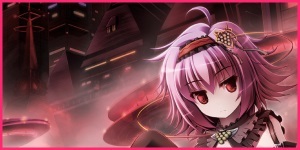 ►Scene 3 Storyline shows that the newcomer vampire Corin Charite had fear that youkai demons will be purified. but who taught that? ►Scene 4 Storyline shows that the wise astronomer Phiased Pescar claimed to see the future of humans and youkai. But hatate just talks back to her by saying "My camera can see the past events, but I cannot know the future. I shall absorb your power and use it as a camera to know the future." If I were to translate that saying Hatate had said it should be like words with "you-thee/thou", "your-thine/thy", that would be quite accurate. ►Scene 5 Storyline shows that they were encountered by an orlean angel, Janet Arc'Angelo (quick reference). The tengu reporters thought she was the culprit, but she was connected to the army of angels. Today thou shalt see the eyes of this Janet to overcome black and white. ►Scene 6 Storyline shows that they were assisted by the emperor of the drifting seas, Suitenguu no Himemiko, to find the sword of Kusanagi that was stolen by the culprit. Just like Tenmu Suitoku said, this Himemiko is more speechful than Tenmu. And that second spell card of Himemiko is going to drown you in a whirpool. If you capture Himemiko's 2nd spell card, you might party yourself because about that, the spell card name was literally "Yaaay"?! I suppose that's true. ►Scene 7 Storyline shows that they were commanded by the defending archangel Michel Sant'Angelo, then this angel also says this: "The Sword of Kusanagi is the sacread treasured sword that protects this land from the hands of Satan." Then I KID YOU NOT, commands the tengu reporters that they will be condemed for wrong teachings after Hatate and Aya fulfilled this unknown gospel? but it goes like "er~ in gospel somehow 5-28; if you want other's things, then is it the same thing as having already stealed in your heart?". We are NOT sure to know where did it come from. ►Im not sure to explain Scene 8 storyline, but I paid less attention to their newfound spell cards. ►Scene 9 Storyline shows that the Sugawara politican Mitama Mahagara, and the Peach Princess Yamatoyo no Momohime appeared from the thin air to convince the tengu to stop finding the culprit before it's too late, but they WERE wrong! So then the tengu reporters took pictures of their danmaku and go to the Outside World to find the angel of ice. ►Scene FC Storyline shows that they found the angel who stole the Kusanagi Sword. We called her Tamako Sant'Angelo, she's lame as she's like she's eight, with wearing an upside-down lily flower on her head. Also I love the dialogue when Aya said the final sentence to the culprit before the start of danmaku capture. It says like something like a bible verse that connotes the sword... you know - "live by the sword, die by the sword bible verse." Just search that on Google. This game is extremely silly. I have way more trouble with it than with the ZUN Bunkachous. Drinking game: count how many times you can find "Tri Focuser" or some variation of. When are we gonna get real art for Vinkawars, anyway? Vinkawars has more history, she was a "let's make the new Fairy Wars character" like Sasha was for Soku. Someone said that Hakujinki is about poking fun at such characters or something, but I dunno about that. No Mitori, you know? it would really help if you would stop purposely trying to use the romanized jp names instead of the commonly used eng names/abbreviations. tbh I like both styles of art, although I do prefer the one who did TLC/MPP/RSS. The BoSM artist still did a fine job with this however, although it might get a bit weird when there's also the exact models from the older games as well. I also doubt we'll see more of stuff from characters in WNSP but that's just me. I don't really know much of this Mitori character or whatever but from what I've seen of her and the boss fight she seems extremely uninspired. Mitori is basically one of the first and perhaps most popular touhou OCs, she was created as a fanmade Phantasm boss for Subterranean Animism. It's not that she's extremely uninspired, but she's much like how Yukari is compared to Ran: her spellcards and danmaku are similar-but-different to Koishi's. Nobody can really tell if older characters will be showing or not, but if I were to guess there probably should be a midboss appearance here or there, like how Gabriel and Mumumu did in MPP and RSS' extras. Between you and me tho, I much prefer BoSM's artist than the previous games'. It looks way more like ZUN's, so it feels 'right' to see it in a danmaku game. That was uncalled for, you know? You probably searched each one to figure out what was what, and let's be honest: that's a good thing. It would help a lot more if you stopped using the totally wrong titles out of tradition/misplaced "convenience". I've put up with that awful broken system for about ten years, and I had enough of it at least five years ago. Look at the UNL disaster. Look at how respectful the HnK guys are of their source. In fact, just typing Tenkuushou is even easier than typing out the entire subtitle, and typing TKS or something along those lines is still easier than typing out HSiFS. You might be able to make a case for some of the fan developers putting more emphasis on the subtitles, but this is because most fan developers aren't on the same wavelength as ZUN about that, and there are only so many fangames you can do this to. You also have to make an exception for subseries like Bunkachou and Sangetsusei, yes, but this is clearly an exception, and Japanese fans (who are pretty important to consider when talking about a Japanese game made for Japanese people) recognize it as such. Call me a "Japanophile" or whatever, and I'll laugh at such nonsense being thrown about in a place like MotK. It's like going to a Naruto forum, as a Naruto fan, and calling other people weeaboos. Anyway, Mitori is just as "uninspired" (what a silly word for a horribly misused idea) as Sasha, Vinkawars, whoever else you wanna name. They were just made for fun little dnh scripts or silly gag images, they weren't made to be "professionally inspected" by the Western fanbase (as they do). The bit in spoilers was a stupid joke directed at there being two characters named Mitori in this space. We use the abbreviations of the game titles simply because it's easier and it's been done for ages now so why change it to something most people don't ever want to use? If there is an English title, then in an English forum, of course we're going to use it! I can read the Japanese text just fine, but others who aren't so familiar with the series, or Japanese, may not. And if you really want to argue, typing it out in Romaji is technically incorrect as well, so you should be typing them in Japanese. And if you really think that Tenkuuchou is easier to type than HSiFS, then try typing HSiFS (yes, even on mobile) a few times and it'll become much easier. You know, as with most of the abbreviations. nice assumption, but no i didn't, i know what the titles mean in japanese and also know what people in the chinese community refer to the games by (abbreviation-wise). you're calling all of us "disrespectful" now for using the name that the community usually refers to? except japanese people usually don't use the entire subtitle at all lol, if you actually talked to people in the japanese community they also generally only use part of the title instead of the entire freaking thing. Like, say, someone got a SA LNN with ReimuC. The Japanese community would say something like 地霊殿L霊夢Cノーミスノーボム which can be shortened to 地霊CLNN. Just follow any of these players on Twitter and check their tweets, it gives you a good idea as to whatever the hell's going on in these players' minds. These abbreviations aren't unlike what people in the English community already do. For the record I really don't care if you are a weeb. I care if you're being purposefully ignorant. Feel free to use whatever you're using but do keep in mind that you're being the unconventional one here. Seems that the creators of that game might forget something, I guess. Besides, I just try selecting and beating hard spellcards before the easy ones. Time to bring back this thread! So, Milka released a new "Kaisendo Direct" which is basically a way for the team to release info on what they've been working on. Next, they announced their new Touhou fangame, Hollow Song of Birds, which is another vertical shmup game. The setting is supposedly a Gensokyo frozen in time, and the mechanics appear to revolve around it even though I can't make heads or tails of what it is. Here's the video in question, now go watch some gameplay, or wait for the TF patch to be released a couple hours from now. We uploaded a video today. basically: The flow of time has been stolen!! Sakuya + Reimu and Marisa (who sakuya unfroze) set out to solve this mystery. A variety of special bombs (Spacetime Spirit Strikes) are provided by Sakuya and they each have a special ability. Also, shooting enemies gives you time crystals that can be used to unleash a time-stopping super bomb thingy. I am SUPER hella down with this. It is clear to me that Team Kaisendokaniknightwhatever ああ、私はあなたが監視しています知っています〜 (´・ω・`) have fully took on the reigns after the RSS hypetrain died off. Y'all are awesome! Trifocuser's Exhibition looks really interesting so far, and those spellcards are completely wack (Tobiko's especially ;o_o). Momiji also looks really cool, especially since I had a fangame idea that kinda works like hers so that may be a good basis. HSoB (Though IMO "Hollow Birdsong" kinda rolls off the tongue better) looks very promising, and I do like the kinda darker AGDP-ish vibes the game gives off, even if Ranran is a nice, silly stage 1 boss. Those flashbomb-esque settings also look really cool, and it is clear that there are some series/doujin-wide inspirations from all of them; FFF status effects, SA Yukari/ISC umbrella, Fairy Wars, Sanae frogs, SA Aya/ISC toy camera but gradual, Chain of Lucidity's hyper mode, EBR Sakuya player + Reisen's bomb grazebox, Dodonpachi Strong Style, the Pendant from Dark Souls, and SA Suika. EDIT: Also, I meant to say, Hell YES art by C@1aM!ty! Their ZUN-style art is top notch. Oh man, I'm so excited for this!! All of the games this team releases are gold, and I'm sure this one will be too! Momiji herself seems incredibly interesting. The four weapons you can choose each have 3 different options, which do different things. You'll definitely need the ability to get i-frames somehow for some scenes, but it's a very open system otherwise. Basically, Momiji holds a charge meter of her own that you press and hold C, or damage enemies, to charge. It can go up to 400%. Then, you hold C to charge attack, and depending on how many rings are charged, with each ring needing 100% each, you can do different level attacks, each of which correspond to the choice you were given in char select. Last thing: to switch from photo characters to momiji and back, you go to char select and hold Z or X or C.
This is obviously a Len'en game in disguise. Jynx is the newest secret member of team kaibaseto. No wonder that dull-looking black-and-grey stage 1 reminded me so much of BPoHC's Ex route! New songs for the Exhibitation stages, or nah? No, but Zenith is a good theme anyway. I didn't expect that scene to make a return in this game. Sooooo apparently I'm not the only one who thinks Ichiyou looks like Narumi. And that Himemiko spell was just beautiful. Also Tamako's spells are absurdly easy with Momiji's flashbombs... I guess some things never change. But Ichiyou came first so wouldn't it be the other way around? This is Seija and Ryuko Matoi all over again!!!!11!!11!!!! How do you get achievement 13, 14 and 27? They're the only ones I still haven't gotten aside from the 125000 score one. Edit: What the heck, I've got over 200k in scene 9-10 twice and I haven't gotten that achievement yet... Has this glitch happened to anyone else? Edit 2: Oh, so you have to get that much in single photo, my bad. Also, there is this spooky image, but from what I can tell this is supposed to showcase the fire-based Spacetime Spirit Strike? I've also haven't played any new STG releases in a while, so having one with loads of customization feels like a treat for me. Although I'm still not sure if I understand the new system fully and I will need to play it before I can judge. And yeah, interested to see Sakuya back again. I've missed the girl since DDC and TLC. So they've removed the Rainbow, White and Black color options? Not really surprised considering how clustered the mechanics would be, but playing without the option of bombing seemed kinda interesting. I see the white crystals are autocollected within the focused circle range, but what does bombing do to the crystals? ...and what's that super bomb thing at the final stage 3 spell? -For some reason it specified 1-1, 1-2, 1-3, etc, so chapters are still significant somehow? -Wow their theme, AMV much? -what the hell, is she actually texting ("SNS") her responses? Also multiple speech bubbles?? ?? ?? ?? ?